Tahir Andrabi is Professor of Economics at Pomona College. He has been a visiting scholar at MIT, a research associate at LSE and a consultant for the World Bank. 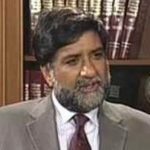 He was a member of the tax and macroeconomic committees of the economic advisory board of the government of Pakistan in 1999-2000. He is a co-founder of the Center for Economic Research, Pakistan in Lahore, Pakistan. He is the principal investigator on the four year longitudinal study (www.leapsproject.org) on quality of primary education in rural Punjab funded by the World bank and the National Science Foundation. He is also the PI on a National Academy of Sciences/Higher Education Commission, Pakistan grant on evaluating the recovery from the 2005 northern Pakistan earthquake.